The construction of TBC’s new building ended on July 3. As a token of thanksgiving to the workers and Manong Fred, the foreman, some TBC women prepared a simple merienda for them. They brought pansit, Bonete bread, Sponge and French cake and pineapple and iced tea. The merienda table was set in the new building. 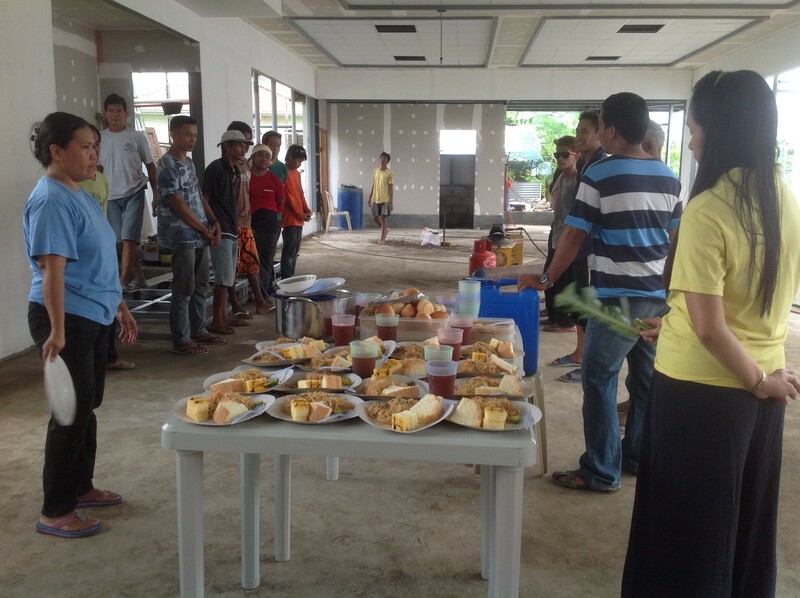 Before eating, Brother Raymar prayed and thanked the laborers in behalf of TBC. Each of the 14 workers were also given a mug as a token gift, and TBC tract, Walong Tanong, Walong Sagot. Manong Fred, as the foreman had a special gift. The workers were happy and the women enjoyed the food and the fellowship. Later, Pastor Andy and Pastor Jeff came for a visit. It was a nice ending for the building construction. The church building is not yet fully finished, but hopefully the church can have her first worship service by the first week of August. Thanks be to God for His remarkable blessing!